Summer Seminar Docs: Welcome, Antennas, PowerSystems, Facilities, UFO's, GPS, P-sat, Thermal, TVsats, Satellites. See Photos from USNA's annual exhibit at the Smithsonian Udgar-Hazy Space Museum's Space Day. The USNA Satellite Lab in the USNA Aerospace Department serves students, faculty and staff throughout the Academy; including students in the various Engineering and Weapons Departments, and even the Midshipmen Amateur Radio Club. The facility is operated by Bob Bruninga, the Senior Research Engineer under the Director of Astronautics, CDR Myre, and the Department Chairman, Dr Karpousian. The lab supports routine labs as well as small satellite development construction and operation. The first 5 satellites are shown above. The latest one called MIDstar was launched in March 2007 and lead by Dr. Billy Smith. This web page provides links to each of the satellite projects and to our specialized LABsat student labs. SATELLITE LABS: We conduct a series of labs for the Astronautics track (and a few labs for the EE, IT, and Physics Departments as needed). 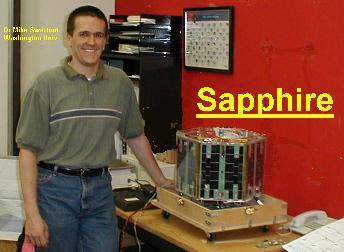 Many labs are based on our LABsats (photo below) which are similar to modules in some of our actual satellites on orbit. This provides continuity from the hands-on student activities in the lab to what they include in some of their actual spacecraft design projects. See our LAB page. OUR Eight Successful SATELLITE Projects: Below are the links to each of our satellite missions that have successfully achieved orbit. The most active at this time are the MIDSTAR and ANDE-Operations pages. Sapphire: . A joint project with the Univ of Washington, St. Louis launched 29 Sept 2001. REX-II: . . 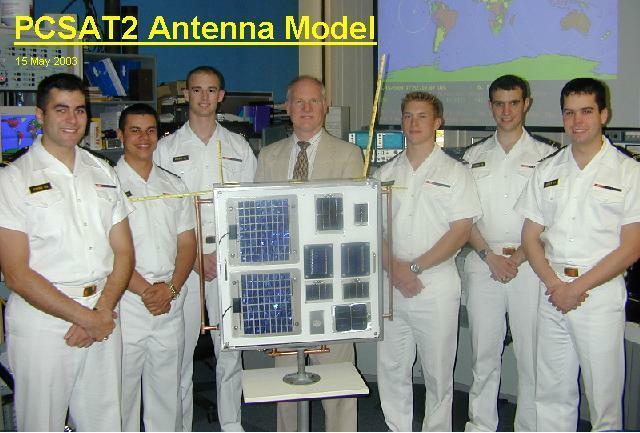 The Radiation Experiment II Satellite operated by Prof Boden (July 99-2002). ARISS: . . Our contribution to the packet and APRS system on the International Space Station (summer 2004). 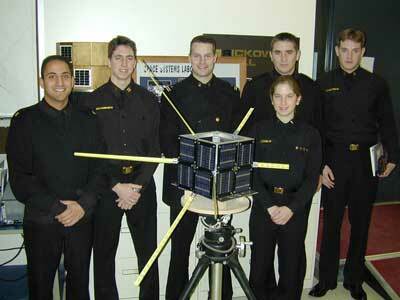 Suggested Student Satellite Projects for Astros, EE's and WEPS majors. ParkinsonSAT Environmental Data Satellite . For relaying data from ocean going student environmental buoys. NEMISIS(sp). A cubesat with tunable EMI receiver for locating Satellite Interference. Science! An external student/outreach comm payload for the ISS. STARSHINE-6: (Deferred). A PCsat style Telemetry/Command/COMM bus. YPSATCOM TRACKING: GPS tracking and communications with our Boats on Summer cruises. 13th CO A/N Game FOOTBALL RUN: December 1999. Satellite Lab Control Room: located in Rickover room 122. Amateur Radio Experiments on the Space Station. 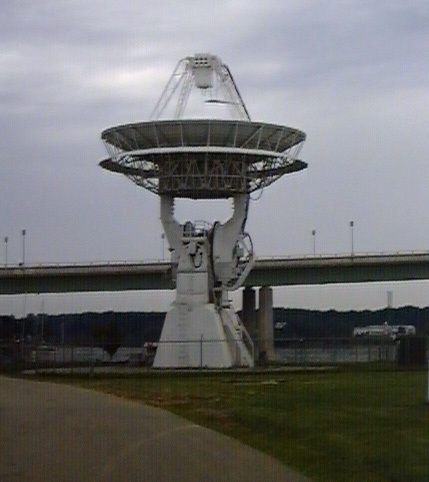 UFO-1 The Navy's "UHF Follow On" communications satellite. TV/Teleconferencing : Occassionaly used for foreign language TV feeds. Multimedia Resource Center One of our 3m dishes provides videw for distribution throughout the Academy. 137 Mhz Beam : Pointed at ATS-3 , A 29 year old communications satellite serving scientists at the South Pole . 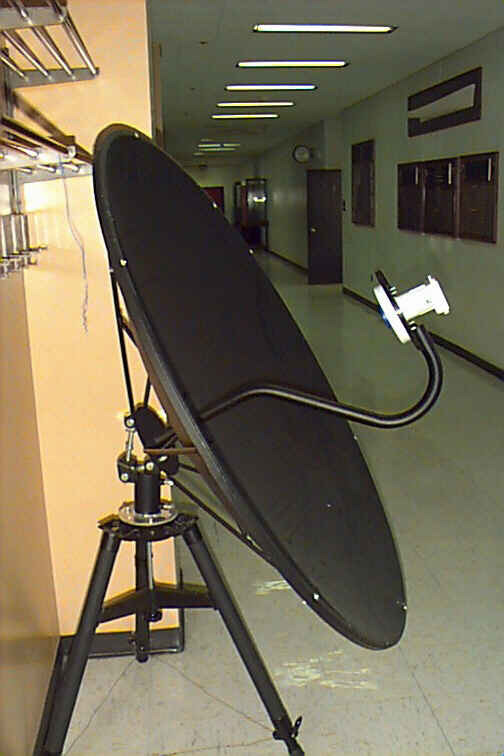 GPS Antenna : A fixed GPS receiver on the roof of Rickover constantly reports position and satellite data to provide a live display of GPS satellite positions and a typical plot of GPS errors. Check out SGPS for info on using GPS on Spacecraft or the main Coast Guard GPS site for general info on GPS. APRS Antennas : A number of antennas receive mobile GPS position reports from the Naval Academy Boats and a variety of other vehicles and networks using the APRS Automatic Position Reporting System . Shuttle: Links to NASA and United Space Alliance sites. Satellite VisibilityTable of this weeks satellite sightings for the Washington DC-Annapolis area. NASA J-TRACK : Spacecraft Tracking System WEB tracker. VISITOR NUMBER: Since 16 Sept 2002. .